DURHAM, N.C. – When the Duke basketball team goes on the road, it’s never just a basketball game – it’s an event. Last week, the Blue Devils helped out the marketing departments at Purdue and Michigan as Duke visited those two Big Ten schools. It’s not just that both games were sellouts. At Purdue, students camped out for seating for the first time in school history. Licensed ticket brokers were asking almost $600 a ticket for prime seating. Duke always gets the best opposing teams – and their fans – can offer. The evolution of Duke’s road “aura” is interesting to track. It didn’t happen overnight. This reporter was lucky enough to cover all three Triangle basketball teams in the 1980s and early 1990s. I can clearly remember 1986, when Coach K first burst through with an ACC Championship/Final Four team. What stands out in my mind are back-to-back trips to Charlottesville that season. On Jan. 30, 1986 No. 1 and unbeaten North Carolina visited University Hall. The dark, dingy arena was electric that night – kind of like Mackey Arena was for Duke last week. The boisterous crowd helped spur the Cavs to an 86-73 upset of the top-ranked Tar Heels. Exactly one week later, surging Duke – ranked No. 4 and just two weeks away from a No. 1 ranking – visited University Hall. The arena was sold out and the fans were loud and supportive, but it wasn’t anything like what UNC experienced a week earlier. It was kind of like the difference in Cameron Indoor Stadium between a normal ACC game and a Carolina game. Of course, that kind of reaction must be earned. In 1986, UNC was reaping the fruits of 20 years of excellence under Dean Smith. Duke was an upstart, just emerging as a power under Krzyzewski. 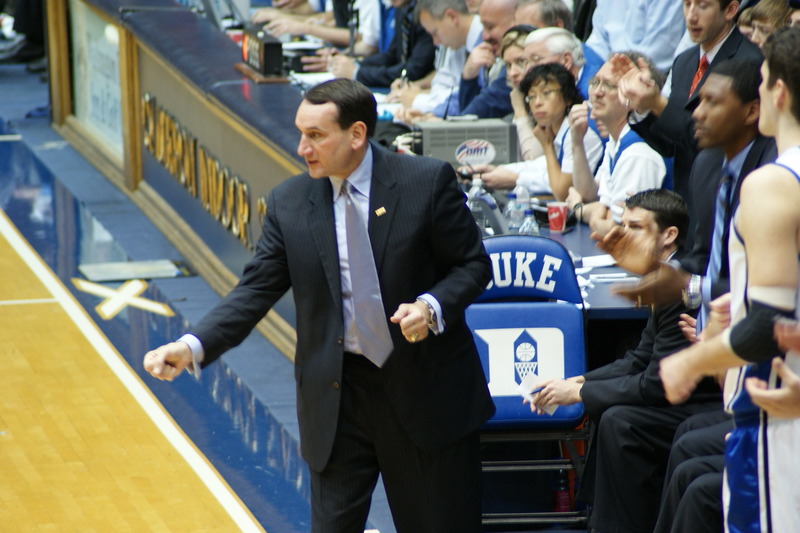 It’s not possible to pinpoint the exact moment when all that changed, but it’s clear that by 1992 – after five Final Fours in six years and Duke’s first national championship – the Blue Devils had become the primary focus of opposing fans. Covering the ’92 Blue Devils was like following a rock band. Buffalo produced the largest college basketball crowd in its history for Christian Laettner’s homecoming. So many fans swarmed outside the Duke locker room that the Blue Devil players had to escape through a locker room window. At Clemson, mobs of fans surrounded the team bus – many of them screaming teenage girls. The hysteria continued in 1993, when this writer noted the same disparity between road crowds for Duke and UNC as I had noted in those two trips to Charlottesville in 1986. Only this time it was Duke that endured the frenzied madness, while Carolina faced relatively normal ACC road crowds. The contrast was most sharp in Tallahassee, where on Jan. 24, the loudest and most enthusiastic crowd in Florida State history spurred the Seminoles to an 89-88 overtime victory over No. 6 Duke ... while a month later, a relative sedate crowd watched No. 3 UNC defeat the ‘Noles 86-76. For Duke, it’s been that way ever since. Not that anybody connected with the Duke program is complaining. Wojciechowski said that’s what he was looking for when he came to Duke as a player. Wojciechowski and Collins had to go through the fire when they were Duke players in the 1990s. Those players currently dealing with the enthusiasm that the Devils face on the road seem to share their appreciation of the situation. Duke’s schedule hasn’t included that many true road games in recent years. Of course, the Blue Devils play eight ACC opponents on the road every season and annual trips to the Smith Center in Chapel Hill and the Comcast Center in College Park, Md., certainly provide as hostile an atmosphere as anyone could want. However, outside the league, Duke has – with a handful of exceptions – been more likely to play its big non-conference games on neutral courts. Part of that is by design. The NCAA Tournament is played in neutral, big-city arenas. It’s good preparation for the Devils to play Xavier in the Izod Center in the Meadowlands (as they will on Dec 20) or Pittsburgh in Madison Square Garden (as Duke did last season). But part of the reason is because several of Duke’s favorite non-conference opponents use big-city arenas as their home courts. Both Georgetown (the MCI Center) and St. John’s (Madison Square Garden) play all their big games in such arenas. Temple often moves games either to the Palestra or the U.S. Bank Arena (where the 76ers play). Krzyzewski’s boast about his schedule is not an exaggeration. In the last five years, Duke’s RPI strength of schedule has been eighth, third, first, fourth and fourth. Of course, it’s not always easy to go on the road and deal with teams and fans who treat your visit as the highlight of the season. Plus, it’s fun to win in such a frenzied environment. But is there a danger of playing so many emotional games over the course of the season? And the positive way of dealing with Duke’s testing road schedule? Duke, after years of being one of the nation’s successful programs in March, has not finished well the last two seasons. But it’s hard to attribute that blip to the parade of pressure-packed games the Devils have to play. After all, that pressure has been there for decades – and previous Duke teams have handled it well. “I think the last two years had a lot to do with youth,” Collins suggested. “There’s no question that our guys were under intense pressure that only a handful of programs have during the year – where every game is scrutinized, where every game is a big game. “I think when you have some older guys, they understand that journey better. In the last couple of years, we had good players, but they were very young players. They were figuring it out and they were playing as hard as they could, but at the end of the season, we just ran out of a little gas and we weren’t playing our best. Everybody in college basketball plays road games. But few programs play the same kind of road games that Duke does. That’s a result of the team’s past success and maybe, just maybe, a contributor to success in the future. Wojciechowski certainly believes that Duke’s impressive performance against Purdue in front of a historically jacked-up crowd at Mackey Arena will pay future dividends for the Blue Devils.